If you’ve been on campus for very long, you are probably aware that the Med Center is a hot spot for watching the Purple Martin migration. They usually start to show up in late July, and by early- to mid -August there will be an estimated 60,000 birds roosting while traveling through campus. Purple Martins are the largest swallow in North America. They often nest in hollows, wood pecker holes, and holes in saguaro cacti in the west, but in the east many of those habitats don’t exist, so they are dependent on houses and other structures provided by humans. This brings them into cities, where they can be seen in large groups. required to help them, so you will see banners and curtains in walkway glass and windows, to prevent them from flying into the glass. Fun fact: most foreign species are introduced into a new geographical area to solve an existing problem, i.e. introduce specific bird to eat specific bug. However, European Starlings were introduced into North America by the “American Acclimatization Society” in Central Park in 1890 who desired to introduce all birds mentioned in the works of William Shakespeare into the U.S. 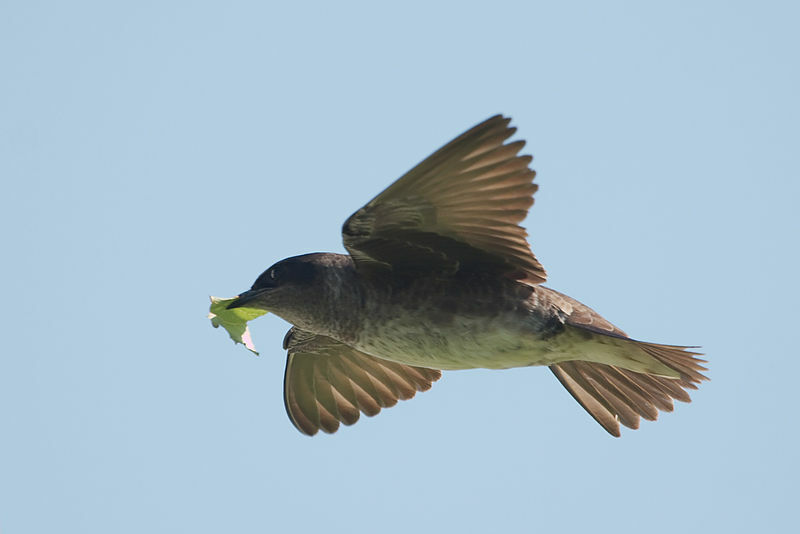 The Purple Martin migration north to Canada is somewhat staggered, with birds spread out over distance and timing, as breeding competition changes their behavior. On the southern trip – all the way to Mexico with some traveling as far as the Amazon basin – they tend to flock together more. They are known for making lots of “chortles,” “rattles,” and “chirps” and this means a flock of 60,000 can make a lot of noise. It also means they leave behind a lot of….ahem, droppings. (Be sure to be extra nice to the Grounds employees who power wash all of it off the sidewalks and windows every morning). The upside? They eat a lot of bugs! Recent studies show that they particularly like fire ants, but they’ll eat just about any insect. They are also fascinating to watch; at dusk they start to appear and by the time it’s dark they are in the ash trees by Kiewit Tower and the Doctor’s buildings. It’s unknown how so many birds can fly together and change direction so quickly without running into each other, but it’s an impressive scene. If you want to come watch, that’s great! Just park your car legally and stay out of the way of emergency vehicles making their way to the ER. Next Next post: Got (excess) supplies?